Your little ones have sensitive skin, so make sure you find safe sunscreen for kids designed to protect them from sun exposure. 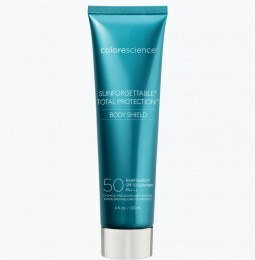 Colorescience’s line of safe sunscreen for kids is crafted with natural ingredients that stand up against the sun’s harshest UV rays. Is it safe to use sunscreen on my child’s skin? Children’s skin is sensitive and vulnerable to the sun’s harmful UV rays, and it’s crucial they wear sunscreen each and every time they head out of the house. A single blistering sunburn in their childhood can double your child’s risk of melanoma. It’s important to find safe mineral sunscreen for babies and kids, as many sunscreen brands contain chemicals that can cause irritation and other harmful side effects. For further information, read our top sun safety tips for kids. At what age is it safe to put sunscreen on an infant? Because a baby’s skin is so sensitive, most medical professionals agree that parents should avoid applying sunscreen until the little one has reached six months of age. However, sunscreens that only contain zinc oxide can be used on small patches of skin. Before this time, use other sun protection methods. 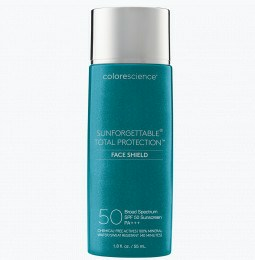 Is Colorescience sunscreen safe to apply for kids? Our safe sunscreen for kids is specially formulated to be non-irritating and ideal for children’s sensitive skin. We crafted our sunscreen for children and babies (6 months and older) using simple, effective ingredients. Our lightweight formula makes it easy to apply our non-paraben sunscreen to your child’s skin – something you can both appreciate. 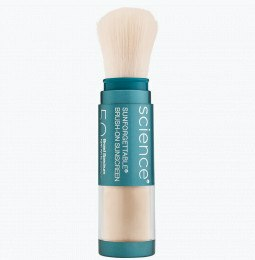 Are sunscreen powders just as effective as sunscreen lotion? As long as you’re applying a broad spectrum sunscreen with SPF 15 or higher, it doesn’t matter what form your child’s sunscreen comes in. 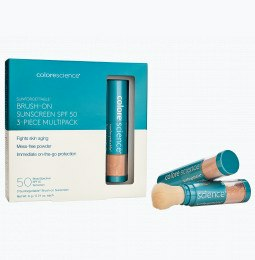 Whether you’re looking for PABA free sunscreen in powder or lotion sunblock varieties, Colorescience offers effective sunscreen in both forms. 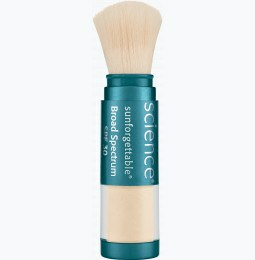 Our brush-on safe sunscreen for kids is a great option for parents of toddlers and infants.